This wonderful photograph was taken in 1950. 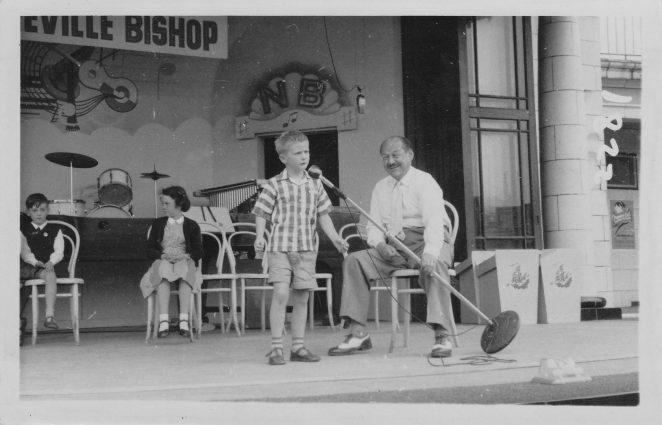 It shows local entertainer Neville Bishop with one of the entrants to his children’s talent show. Unfortunately we do not have any further information. Do you remember the smiling Neville and his talent shows? Where were they held? Were you a budding singer or entertainer who took part? If you can contribute a memory – or information – or even a photo of you as an entrant – contact me jennifer@mybrightonandhove.org.uk and we will make you star once again by publishing your photo here. I think this is the Aquarium, my husband remembers talent show there in the late 50s. This could be on the Aquarium Sun Terrace, but if you Google Neville, he was appearing at Great Yarmouth about this time. Could this photo be fromn there? It looks like Eastbourne Bandstand. Yes the wooden shutters and the style of architecture look like Eastbourne but the columns on Eastbourne’s bandstand are fluted – not tiled. I think this is ‘The Marina’ in Great Yarmouth. Check out this website, http://www.ourgreatyarmouth.org.uk/page_id__456.aspx Neville played at Great Yarmouth. This looks suspiciously like the Marina, Great Yarmouth. Neville Bishop was resident at this venue for most, if not all of the 1950s. I can confirm that that photograph was taken at The Marina in Great Yarmouth. That was the year I was born and that is my Father! I have in my possession a photograph of the Neville Bishop Band from the mid-1930s. One of the musicians in the band is Jack Mossel, on whom I’m doing research at the moment. The rest of the band, except for Neville Bishop himself, are unknown to me. I hope to reconstruct the line-up of the band. Please contact me at bernard@panrecords.nl if you think you can be of help and I’d be happy to send you the photograph. This photo is The Marina, Gt Yarmouth, Neville Bishop’s Mcnamras Band, our family went every year. Still have the photos just great!